Welcome to Big Steps Play My Little Farm! 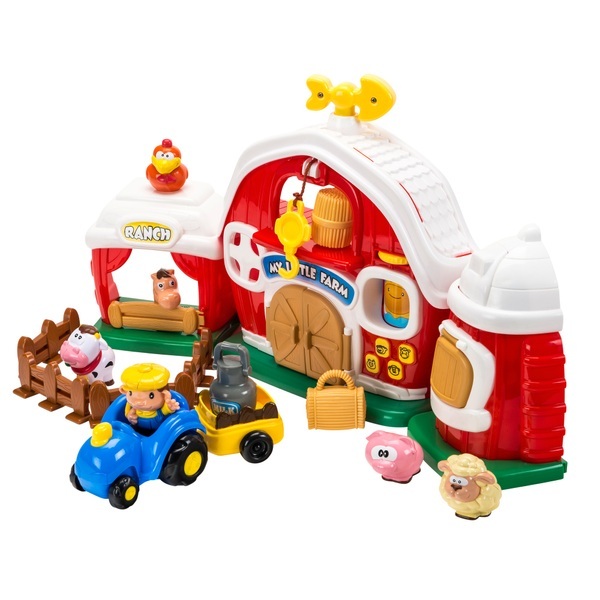 This cute playset come with 5 friendly animals and a whole lot of features. Little ones will love exploring with the farmer on the tractor and trailer. The trailer has enough room to carry one animal around the farm on storytelling adventures. Kids can act out a whole day on the farm, spinning the wheel to see the sky turn from day to night. Pick the milk up from the milking shed, corral your animal with the 4 fences and use the working winch to bring the hay bale up to the loft. Big Steps Play My Little Farm offers kids a fun way to learn animal noises, explore the farm and take a Big Step into a world of role play fun. When kids imagine themselves in new roles, they learn about how the adult world works and develop important social skills such as language and empathy. Every toy is a storytelling opportunity, allowing children to develop self-expression and experiment with problem-solving. Children discover the world through play, exploring sounds with the animals, responding to bright colours and learning to recognise objects by touch. Role playing with the Big Steps My Little Farm can help children to develop gross and fine motor skills, including put and take skills and hand-eye coordination.